Too late to move one of my tomato plants? I bought three tomato plants about a month ago and planted them together in a 2X2 container. I had no idea they were going to grow as large as they have. They are MASSIVE:shock: ! They have flowered and but only one of the three has put out fruit so far..... would it damage the plant if I moved one to its own container? And tips on moving if its not too late? You can move it, but it still may affect all 3 plants, depending on how much (if at all) the roots have intermingled. The less you disturb the roots, the less shock the plants will suffer. Leaving it in place might not be the best option, either, however, because it will have to fight with the other 2 plants for nutrients and water. JMO. Doh! I water them generously each day so hopefully there isn't too much competition. I had read that the soil needs to get sunlight too... we'll that's not happening because they are so huge and wondered about moving one. Ah well, lesson learned for next time! I would separate them. If they don't even have fruit yet, they are still going to get a LOT bigger. And no matter how much you water them, they still will be competing for soil nutrients and tending to shade each other out. Also with less air circulation around all the stems and leaves, they will be more disease prone. I think I'll try to move the two biggest ones to pots this weekend. Wish me luck! Yes, you DEFINITELY want to move them after seeing the picture. What sorts of tomatoes do you have? Do you know if they are determinate(growing to a specific size) or indeterminate(will grow as big as their habitat and season allows). Many tomatoes are indeterminate, in which case you will want the biggest pots possible, or you will be running into the same problem again. I'll have to check the tags, I don't remember if they are determinant or indeterminant. So I moved one of the 3 tomato plants yesterday. I think the two I left in the container are going to be okay together. The guy is in a pot all by his lonesome now... did okay yesterday, today he's sad and wilting..... I'm going to baby him and hope he perks back up. Anything special I should do for him? Likely just a little bit of transplant shock. Since it's in container, move it so it's not getting the hot afternoon sun (assuming you are having any hot afternoon sun... we are still in rain, rain mode). Keep it from drying out but don't over water. Should perk back up in a day or two. Hope your tomatoes do well. This explains just how large the tomatoe's root system gets. It also gives you an idea of how much you handicap a tomato by growing it in a container. Yes, indeterminate tomatoes can get very large. They will grow until they get frozen. 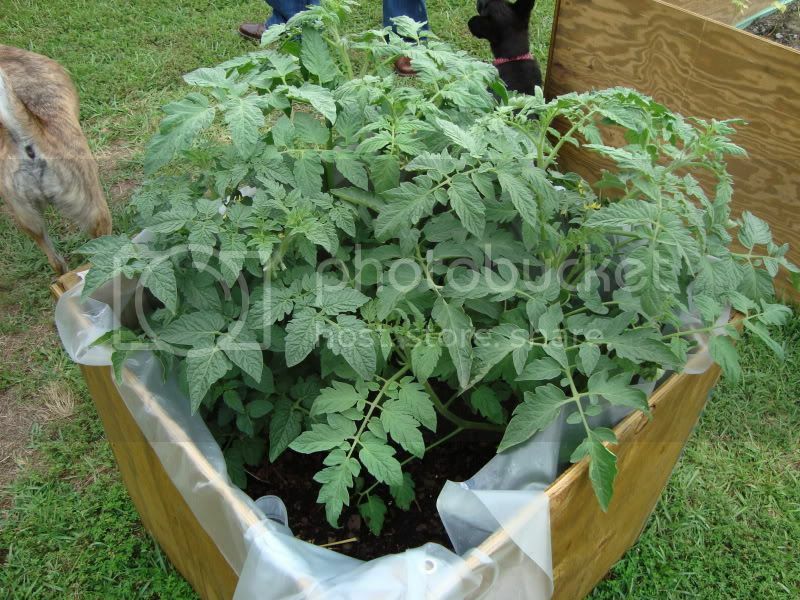 Can I move my newly planted tomato plant? Success! Healthy Plants - Now, When Do I Move them to Pots?